"Ladies, meet your newest #fitspiration from adidas PH"
Manila, Philippines – Entitled I GOT THIS, the campaign adopts a strong, bold and powerful tonality targeting the active women of today. The aim is to grab her attention and provide authentic, visceral and compelling content that enables the athletic woman to live her active life her way, across multiple training methods. The campaign launched late November, just in time for the holiday season and taps into the insight that active women are always on, and committed to their training routines all year round. This year, adidas Philippines introduces their newest fitness ambassadors, active women who are already influencers in their own fields. “We’ve chosen the perfect ambassadors who embody the versatile athletes we want to talk to. These are the women who are willing to take up the challenge, sweat their hearts out, struggle through a tough work out, and still push on. These are the athletes who constantly tell themselves, ‘I got this’. They reach a point where they just want to stop… and decide not to, pushing themselves to be stronger. adidas will be with her every step of the way by gearing her up with everything she needs to reach her fitness goals and continue pushing further,” shares Jen Dacasin, Brand Communications & Sports Marketing Manager, adidas Philippines. Joining current adidas women ambassadors, Anne Curtis, Solenn Heussaff, and Belle Daza are actress and host Coleen Garcia; volleyball stars Aby Maraño, Melissa Gohing, and Charo Soriano; event host and Lady Volcano Cassie Umali; personal trainer Fay Hokulani; yogini and certified raw food chef Mona Lisa Neuboeck; yoga and dance fitness teacher Nikki Torres; crossfitters Nickey Reyes and Trasienne Estrada; and indoor cycling instructors Yessa Yu-Caparas and Rachelle Que. These athletes will be the new voice of inspiration for the active woman. I GOT THIS showcases the best of adidas. The full adidas women SS16 collection offers everything the active woman needs to ensure she can work out to the full and look great doing it. 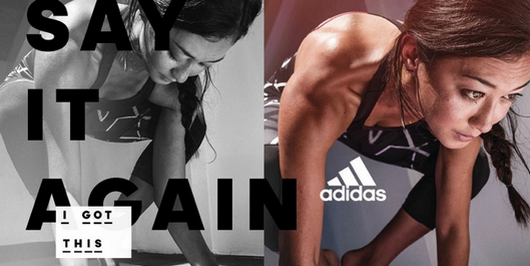 Join the conversation @adidasph and @adidaswomen on Twitter and Instagram with #IGotThis and #adidasph.